Time is swinging toward the harvest of 2013. What is that he says? Ok well, it is still a little ways off but closer than we probably think. The buds are getting fuzzy and green shoots will show in a week or two. I can feel the breeze of the next chapter on my neck and it sure is exciting. This agricultural stuff is a real pain. You only get one chance at it every now and then. If you are a welder and you don’t get it right you can try again. We have to wait a year to try again so you better have a good plan when it comes around. Some days, weeks, months, years go by almost without notice. Of course, within any of those periods events of great significance occur. Last weekend seemed to be one of the ones where something big did happen. The sun was out and days were warm. A few plum trees even started to bloom. Winter seemed to be changing to spring. Yes, it was February 1st. It is never too early to feel good. By Monday the weather had cooled a bit and reminded me that it was indeed February. I know that the glimpse of spring over the weekend was a crystal ball and full spring will be here soon. In the vineyard we have to get the pruning done before the real spring comes and the vines start to grow. So, during the next several weeks that is where you will find us. Hope it will be sunny. During this time of year, about the only thing that concerns us in the vineyard is making sure the vines don't wash away. This is by far the quietest time in the vineyard. The vines get a well deserved break before we start all over again in the Spring. In the winery we are still finishing the 2012 wines and watching over wine of previous years. In general, this is a time to breathe some fresh air and relax with our friends. I hope you pay us a visit so we can share some stories and wish you Happy Holidays. A few weeks ago the grapes bloomed and the vineyard was filled with sweet perfume. I don’t think many of us associate grapes with fragrant blossoms but the vineyard sure is especially wonderful for a few days. All that is now past and the small berries are growing. Now that the berries are there we see the beginnings of the fruit we will pick. This always brings a mixture of excitement and fear. Oh boy this looks great, Oh boy you mean the fruit will be in the winery soon and we still have to bottle to make room! It will all work out because it always does. And because it always is, I can already declare this the “best vintage ever”! We are going to have fun for sure. Sitting inside watching the “we need it” rain come down and prepare the soil for early spring growth. 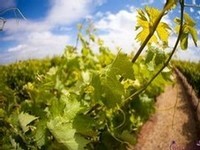 The buds of some grape varieties have already started growing and most of the fruit trees have blossomed. We are once again at the beginning of a season and anticipation is high. As soon as I write that it sounds redundant, seems I am always looking with hopeful expectation. We are pruning, we are harvesting, we are blending, we are bottling and we are meeting people. The list goes on. In this season of rebirth it is, perhaps, easier to get excited but reasons are always there. Pay attention to the things around you (they are wonderful) and welcome the future. 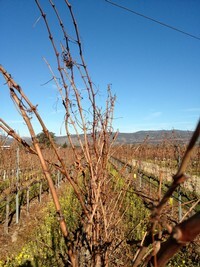 It is not quite March and time to prune our vines. 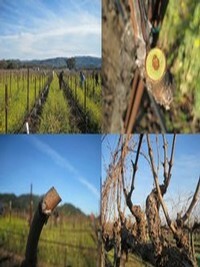 For a variety of vine health related reasons grapevines are usually pruned shortly before the season starts. So I guess the season is about to start and it is time to get going on the 2012 vintage. Pruning is the first big step in determining the quality of the fruit will harvest. It is always a time of hope and optimism. Nothing has really gone wrong and the future looks bright. That feeling lasts for a month or so and then you remember that a lot can go wrong. So, I guess we will see what happens. I think we know that things will not go exactly as planned and our course may have to change but we will be smiling and still optimistic at harvest. That is just the way it is going to be. Guarantee. Sitting in the middle of a vineyard on the 7th of January and the trusty “smart” phone says it is 66 °F. Going back to the 1st of December the weather report says 0.01 inches of rain and I am not sure I remember that. What does all that mean? Who knows? Can’t do much about it but you can’t help but notice, relax and enjoy the sunshine when it comes around. We are pretty enthusiastic about the wines we are preparing to bottle in a couple months. They are a pretty exciting group of whites and many will only be available to the wine club. Hint hint if you are not yet a member of the club it is time to step up. Happy New Year to you all, I am going to go for a walk. I think I remember that last winter I got stuck writing about the weather. Maybe tis the season. For the most part, this winter has been sunny and dry. We are having fun with the new wines, feeling a little relaxed and excited. Time for walking, reflection and wonder. As I walk I am amazed at how fast the temperature changes. Coat is on with frost in the morning, shirt only in the early afternoon and then a rollercoaster dip to cold at 4 pm or so. As soon as the sun goes down so does the temperature. You have to plan ahead. Hootie and I went out at 3, I was glad I remembered to bring a little extra jacket. It gets cold but the light is so beautiful. Stay warm, catch some light and enjoy your Holidays. Toward the end of Ernie’s life he worked on a “statistical” book of California grape production. This was not a simple exercise meant to document varieties and tons but meant as an exposé of what he rightly understood to be deceptive wine labeling. The clear conclusion was that in most premium wine grape regions there was a lot more wine being sold than the grapes grown there could possibly produce. In most cases this is probably not illegal but extremely deceptive nonetheless. In the US, wine representing an appellation is required to be 85% from that appellation. Some wineries in expensive appellations give winemakers instructions to be sure to use the “leftover” 15% with lesser valued grapes. I am not saying that these grapes are poor but just that they are not of the appellation and their presence is never revealed. I think I want to know what is in the bottle. Berryessa Gap – 100% Yolo County!